Put down your phone and pick up your head. 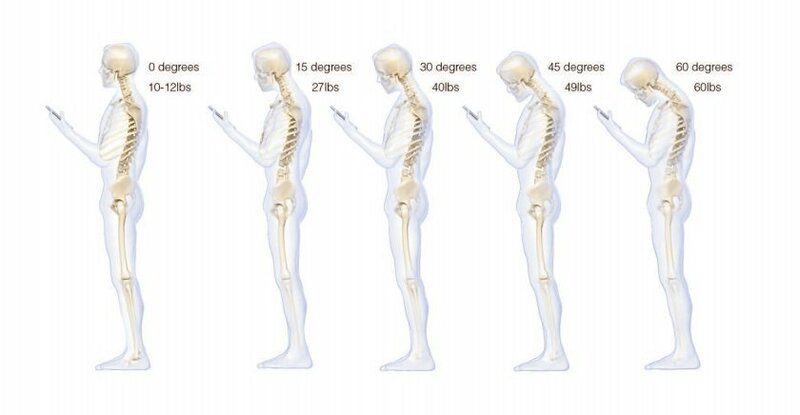 Texting might be ruining your back. 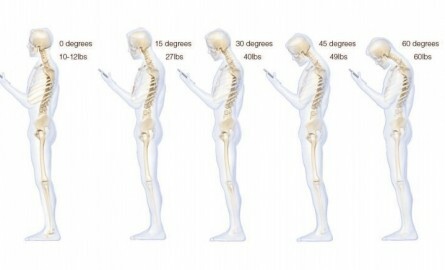 When you tilt your head forward 60 degrees to look at your phone, you’re putting 60 pounds of pressure on your neck, according to a new study by New York spine surgeon Kenneth Hansraj. Hansraj’s study was just published in Surgical Technology International’s 25th edition. Hansraj created a model of the spine via computer-aided design, and bent the head 0 degrees, 15 degrees, 30 degrees, 45 degrees and 90 degrees, all while measuring the force on the spine. “It’s a very sophisticated assessment of the stresses that are borne by the neck when the head is in various positions,” Hansraj said in a phone interview with The Huffington Post. “This is one assessment just based on bringing the neck forward,” Hansraj said. Different things could happen to your neck if you’re bending it forward and to the side, he noted. Hansraj also pointed out another common spinal issue: sitting at a desk all day. For office workers who spend their days staring at a screen, some options for alleviating back pain include making sure you stretch, taking frequent breaks to walk around, and positioning your monitor so that you’re looking at it straight on.